Numerous people, especially women, suffer from the foot condition known as a bunion. It is a crippling condition, the causes of which are not completely understood, even though it is often hereditary and can become worse, if you wear the wrong type of shoes. In the most serious cases, surgery is required to correct Hallux Valgus. In recent years, the trend has been to use mini-invasive, keyhole techniques to operate on patients which, in addition to giving excellent results, allow much shorter recovery times compared to traditional surgical techniques. The use of this technique for purely aesthetic reasons is, however, totally excluded. The causes can, therefore, be genetic (idiopathic Valgus) or secondary, i.e. linked to other conditions (calcaneal Valgus and pronation of the talus joint) or to autoimmune and degenerative conditions, which cause structural alterations of the foot. Footwear, however, does not directly cause Hallux Valgus, although very high heels or very narrow toe caps can worsen any inflammation already present in the area and aggravate an existing bunion, due to the mechanical conflict involved. The deformation of the big toe towards the other toes of the foot is the principal symptom of the condition. It is often very painful, especially if pressed or if weight is loaded on the part of the foot affected by the bunion. The appearance of a bony protuberance or “bunionette” is the visible indication of the condition and it can worsen if the shoe compresses it. The affected toes may also have many calluses and red, hardened skin with reactive bursitis, which can also become infected or ulcerated. If the condition is serious, it can cause a change in the shape of the foot, highlighted by a progressive deformation of the shoes, which can become increasingly uncomfortable and difficult to wear. These changes can also cause difficulty in walking, due to the important role the big toe plays in pushing the body forward and balancing your weight. In order to slow the process of worsening of the bunion it is extremely important to treat the condition as soon as possible. 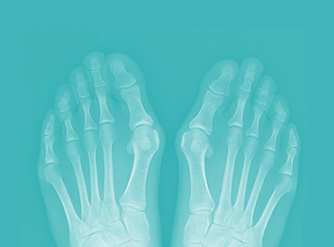 After a careful, thorough initial consultation, the PBS doctors and orthopaedics will be able to decide whether the patient can be cured using medication or whether surgery is necessary (discover the PBS Procedure to treat bunions). The principal non-surgical treatments consist of the use of orthotics, sole-inserts and painkillers accompanied by the use of broad-soled comfortable shoes with low heels. The moment these so-called “conservative” do not bring any further benefits, surgery will then become necessary.